If there was one thing I noticed during the 2012/13 NBA season it was the offensive strategy of the Houston Rockets. This was commented on throughout the season by several people around the league and the media, whether for better or worse. The Houston Rockets became my personal pet project of fandom behind my hometown team. After the steal of a trade where GM Daryl Morey acquired franchise caliber talent in SG James Harden as well as the restricted signing of defensive/rebounding stalwart C Omer Asik. I enjoyed the way that the team was put together and once I started watching I loved the style of play just as much. 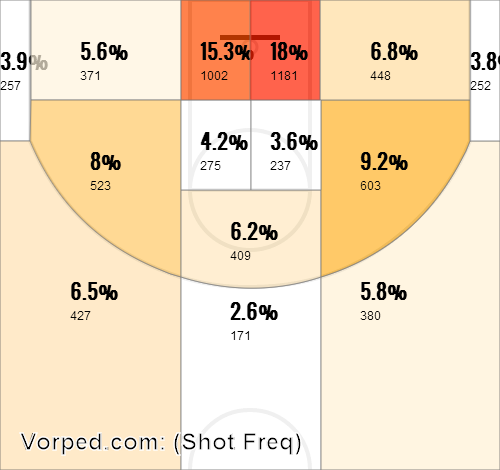 I understand that this shot chart doesn’t tell you a lot with out some context and explanation. The red and orange spots are considered to be on the higher end of the amounts of shots while a spot that is blue would be far below a normal amount of shots in that specific zone. As you can see, the Rockets take a lot of shots behind the 3-pt line and AT the basket via drives, transitions and some light post work. The shot selection of two players on the Rockets really shows just how real this strategy is for the Rockets, James Harden and Chandler Parsons. 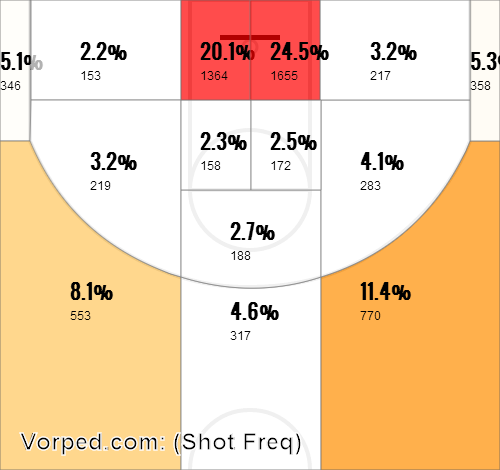 Take another look at both of those charts…Parsons in particular. James Harden took a fair amount of shots in the mid range because he was the singular leader of the team on the offensive end of the floor. Even if you despise the long 2-pointer there will always be situations where it is the best shot or the only shot and must be taken. 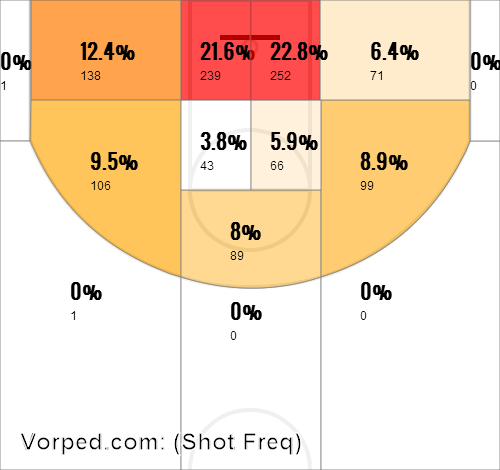 Parsons on the other hand is the epitome of an efficient shot taker (in most ways but not in a very specific one). He takes a large amount and hits a large amount of the ever more popular corner 3. The shortest 3-point attempt on the court and a shot that take the entire team to get an open look at it. Why the entire team? Easy, because of the fact that it is a closer shot that is still worth the extra point, teams focus on having their wing players able to close out on the 3-pointer. If the 3-pointer is closer to the basket and therefore closer to the defender, there is a better chance that the defender can successfully close out on the shot and force the pass or the miss. You notice an almost complete lack of the long 2-pointer by Parsons and I can guarantee that it was made very clear to him that he was near forbidden to take those shots when he is such a capable 3-point shooter. 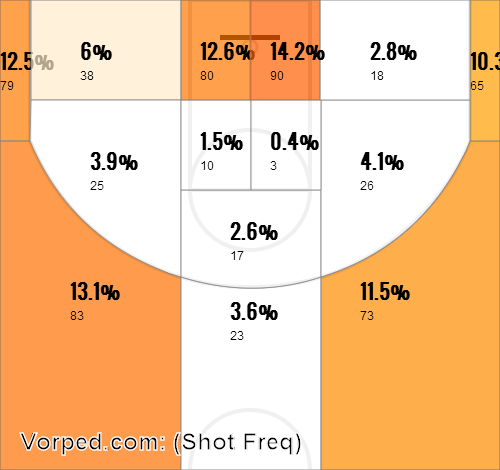 What is that secret piece that Parsons is NOT being efficient in his shooting though? 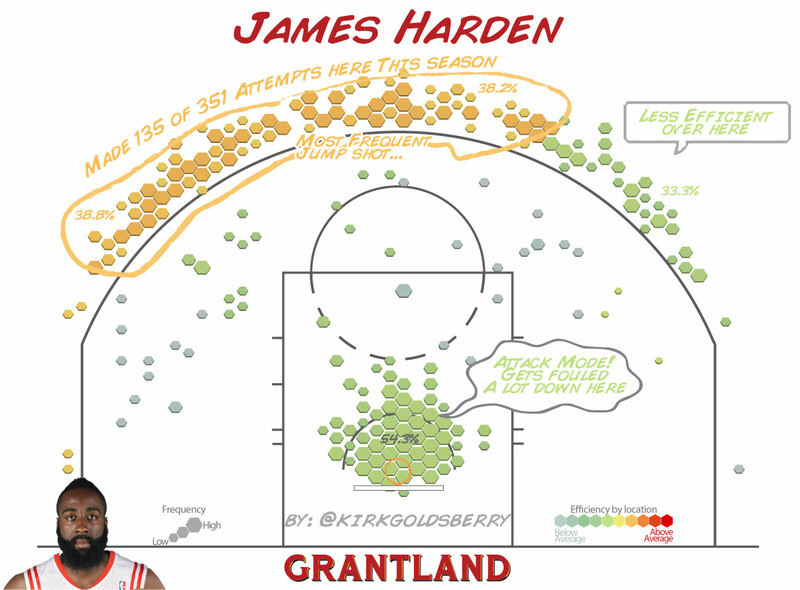 Well his 3-point shot from the wings is below average and when you compare that to the Vorped.com chart of the entire Houston offense, not to mention Parsons own shot frequency, you can see that the Rockets love to take the wing 3-point shot. This could very well be just the work of a rookie and could very well improve as he continues to refine his shot, but the corner and straight on threes that Parsons can hit are a huge boon to his value as a contributor to the Rockets spacing. 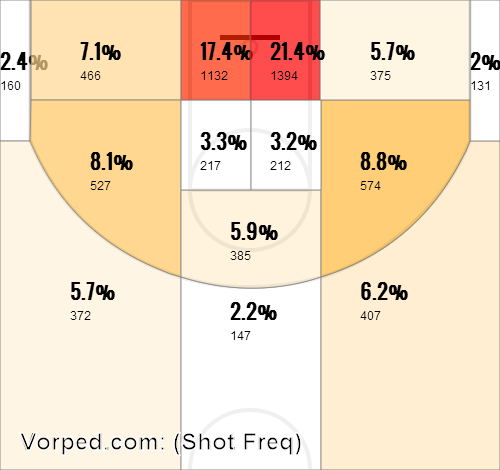 Both the Chicago Bulls and Washington Wizards have orange zones in the dreaded mid-range zones. But, it is too easy to say that they took inefficient shots and to punish them for this. Yes, in an ideal world you want your team to get to the basket and take open 3-pointers whenever possible. What makes these two teams more or less at blame for these shots? Their team composition of course. The Chicago Bulls played all of the 2012-2013 NBA season without the leader of their offense in most categories and the only player on the roster that was a true penetration threat, PG Derrick Rose. Based on my cursory research I found that about 20% in each at the basket zone is preferable for good teams, Chicago still got some close looks via C Joakim Noah and some surprising drives from players like SG/SF Marco Bellineli and PG Nate Robinson. However, the offense needed one particular player to step up this season to hold the offensive load…PF Carlos Boozer. (You can read my recanting my longtime hatred of him here.) Boozer isn’t great at getting to the basket anymore but he still has an above average fall away jumper…in the mid-range. That’s why the Bulls took a combined 20% more of their total shots in the mid-range than the Houston Rockets (1,300 shots for a possible 2,600 points). On top of the mid-range problems, the Bulls simply didn’t have very many efficient 3-pt specialists and so the mid-range was where they had to do their spacing. The Bulls built their team around the roster they were given and created an offense that was good enough to support their stifling defense. I find it harder to blame Thibodeau and his coaches for the problems of the offense than the next team. In the end, the offensive efficiency isn’t the only factor of a team’s success. The Chicago Bulls became a successful team with defense and a mid-range, catch and shoot game. The Wizards were ultimately unsuccessful (although did look much better this year after the half way point than many playoff teams in the East) in their season, but they ran a similar mid-range game by their shot selections. I would love to see what the Wizards can do if they embrace improved shot selection in the coming season. Maybe Wizards GM Ernie Grunfeld can put in a call to Daryl Morey or Zach Lowe.